LIES! LIES!! LIES!!! …. and then some!!!! Just look at the lead stories in Israel’s media outlets…. Here are the latest updates on the Flotilla situation…. The posts that follow deal with the situation at sea…. The Israeli press, mouthpiecing the Israeli government, wants you to believe that those attacked were armed terrorists with connections to terrorist organisations. The TRUTH can be found in earlier posts on this Blog…. updates will follow. 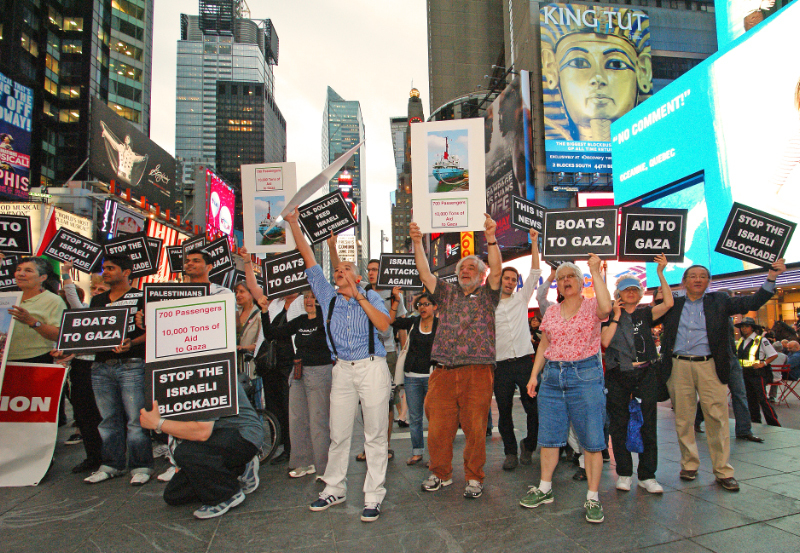 In Europe actions are planned to protest the murders at sea…. BRUSSELS,The European campaign to end the siege said Israel will pay dearly at the media and political levels for its brutal attack on the Freedom Flotilla convoy earlier this morning, especially since Europe will move to condemn this crime. The European campaign, one of the convoy organizers, said the Israeli troops’ hijacking of the ships and their use of live bullets and tear gas grenades are acts of piracy and aggression against hundreds of non-violent people who wanted to deliver humanitarian aid to the impoverished Gaza people. According to different news reports, 20 people were killed and dozens injured when Israeli troops stormed the Freedom Flotilla ships at dawn Monday. The convoy was attacked in international waters, 65km off the Gaza coast. Earlier, a number of European cities on Sunday witnessed a series of events in solidarity with the Freedom Flotilla convoy, especially in the wake of Israel’s threats to attack the ships and arrest the passengers aboard. These events took place in response to the invitation made by the European campaign which called for organizing sit-ins and marches in solidarity with the convoy. In the Austrian capital Vienna, more than 2,000 people participated in a protest to condemn Israel’s intentions to attack the convoy ships. Other pro-Palestinian activists also staged a solidarity march aboard a number of boats at the Italian port of Genoa. A large tent was pitched in the Swedish city of Malmo in solidarity with Gaza and the Freedom Flotilla convoy. CONTACT the Israeli embassy nearest you and let them know that you condemn Israel’s actions. CONTACT your own government officials urging that all representatives to Israel be recalled. Israel MUST be isolated from humanity. Urge them as well to expel all representatives from Israel. Israel has officially declared war on humanity….. THEY MUST NOT BE ALLOWED TO GET AWAY WITH THIS. Needless to say, these brave men and women, these known and unknown soldiers deserve our utmost admiration and appreciation. They are acting on behalf of humanity, a humanity that has nearly succumbed to callous apathy and criminal indifference toward its weak and its poor. After all, Gaza today is very much like Ghetto Warsaw of 1943. The comparison might raise some eyebrows here and there, but the truth, in case people still care about it, is that Gazans are completely dependent on the good will of the peoples of the world for their very survival. If they approach the wall of death on the Israeli side, they are summarily killed by indifferent bullets fired by an Israeli soldier who is likely to have been taught in his neighborhood synagogue or local yeshiva (Talmudic School) that non-Jews are virtual animals whose lives have no sanctity whatsoever. And if they seek life westward, e.g. through the tunnels, they are gassed or killed by the criminal hands of a depraved regime that has demonstrated more skills in groveling, like a meek dog, before Zionism than in providing bread to its own citizens. 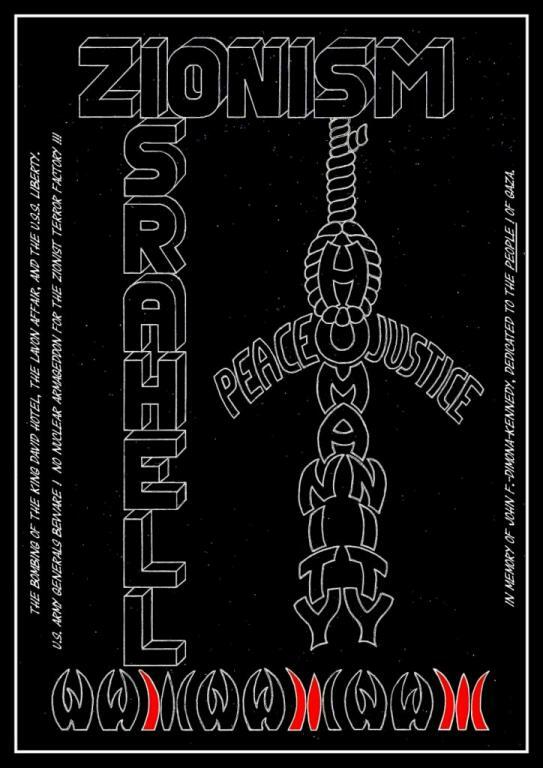 In the meanwhile, Israeli leaders are threatening to violently confront the messengers of love and good will who have come from distant lands to show solidarity with the people of Gaza who have been thoroughly savaged by the very people who have the Chutzpa to claim themselves as “a light upon the nations” when in reality they have demonstrated ad nauseam that they are actually an abomination, a cancer upon the world. 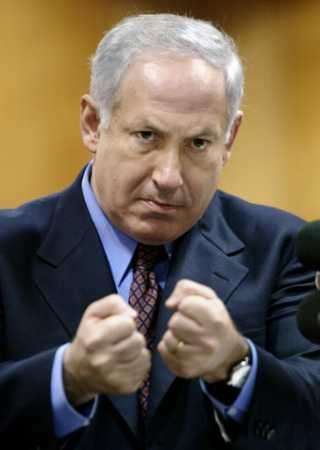 In short, we are talking about a showdown between the forces of evil and darkness, represented by the goons of Judeo-Nazism, people like Benyamin Netanyahu and Avigdor Lieberman, and, on the other hand, the forces of hope, love, peace and justice, which these sublime human beings represent. Well, from experience, we realize that the Nazis of our time in Tel Aviv are capable of embarking on the worst scenario. Indeed, a state that is capable of raining White Phosphorus on the heads of Gaza children can’t be expected to act gracefully toward messengers of peace carrying milk powder to the blockaded children of the coastal enclave. In the final analysis, we are talking about a breed of evil-minded people who would consider a smile on the face of a Gaza child a security threat? Israeli leaders have been spreading disinformation and dark propaganda around the freedom flotilla. Lieberman, the manifestly fascist foreign minister of the Zionist regime has been claiming that the Freedom Flotilla is besmirching Israel’s image as if that image needed any further besmirching after the virtual genocide in Gaza 18 months ago. Well, Never minds. These are the same Zionist thugs who have been calling their victims similar epithets because the Palestinians are refusing to disappear and are still fighting for their freedom from Zio-Nazism despite the passage of more than six decades of oppression and criminality. The Zionist Kriegsmarine may very well gang up on the civilian ships transferring relief materials to the besieged people of Gaza. One even can’t rule out the possibility that some activists might get hurt. In the final analysis, violence, coercion and cruelty are the natural trademarks of Zionism. This is the way they think they can feel virile and manly…by starving and killing children and posing for a photograph right beside the kill.!! None the less, this is already going to be a losing battle for the nefarious state. Exposing the cruel, or more correctly the Nazi nature of Israel, will be a victory for the forces of freedom and humanity and a definitive defeat for the forces of cruelty and hate. 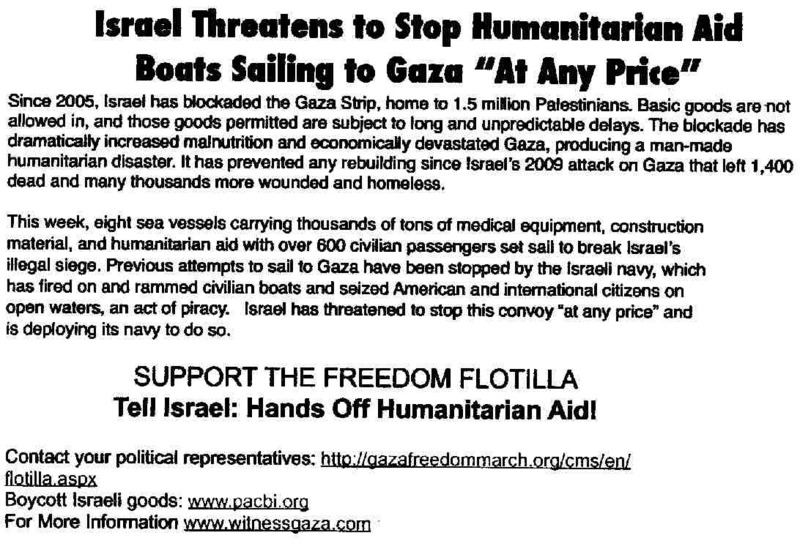 The Freedom Flotilla is really dividing the world according to its moral conscience. There are those who would rise up in solidarity with the people of Gaza, irrespective of any political ramifications that they might have to incur consequently. Turkey and a few other countries represent this camp par excellance. To its people and leadership, we say a big thank you. And then there are those who are watching, waiting to see how this episode will unfold. These are the morally-confused, people who are blind in this world and will be blind in the hereafter. And then there is the whoring western world and its numerous puppets, including the US government, and some European states, such as Germany and Italy and probably the government of France as well, which are reluctant to force Israel to lift the sanctions on Gaza for totally unjustifiable reasons. As to the Jewish people, apart from a small minority which deserves admiration, they seem to prefer to worship the Golden Calf rather than obey Moses an Aaron. I am saying this because supporting Israel right or wrong is an act of paganism and idolatry. True, Israel is tormenting the people of Gaza, indeed most Palestinians. This may make you happy. It might please you as it may make you powerful and important. But Israel is also killing your humanity, by making you insensitive to her crimes against another people, the helpless Palestinians. How many times did your Bible exhort you to refrain from tormenting the “stranger” amongst you because you yourselves were “strangers” in the Land of the Pharaoh? This is why you should wake up before it is too late. If your corporate media is not showing news on the Freedom Flotilla and Israel’s piracy, turn on Al Jazeera or scour the net. The Flotilla of civilians carrying humanitarian aid to Gaza has been attacked by Israeli forces roughly 65 km Gaza’s coast… that’s international waters. I came to Gaza by boat in November 2008, and while I expected we could be stopped, abducted and deported by Israeli pirates in naval boats, I never thought they would actually kill us, despite recent history [the countless Palestinians killed, the international activists and reporters killed]. And even last night, despite the Israeli war on Gaza last year which killed nearly 1500 Palestinians, nearly all civilians, and in which Israel’s war crimes were too shocking and numerous to comprehend, I still ‘only’ expected Israeli naval pirates to abduct the justice activists. Not kill. Find the Israeli embassy nearest you and let them know how you feel. 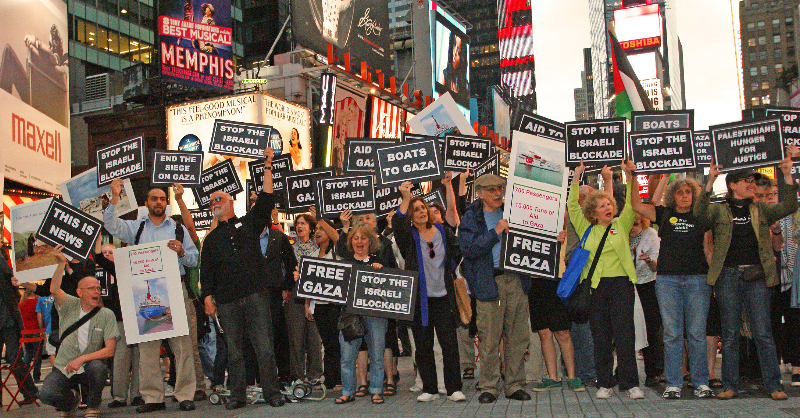 In 2009, Israel pirated a Free Gaza boat, abducting all passengers aboard. PLEASE reproduce this image wherever possible…. 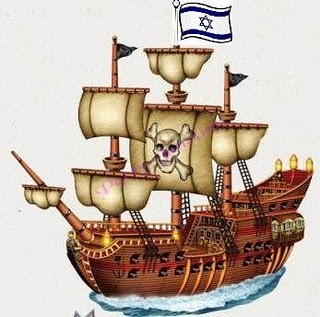 Israel must not be allowed get away with these murders…..
Israeli criminal navy attacks humanitarian ships in International waters. Reports of 10-16 humanitarian activists killed and 50-60 injured. The Israeli army had tried to make the media maneuver of saying they would arrest and take the boats when they enter Gaza coastal waters and tow the boats to port in Asdod renamed Ashdod after the occupation of 1948) and had prepared tens to house the arrestees at that southern port. Instead the Israeli army decided to execute a surprise maneuver and attack the boats at night and in the north near Cyprus in International waters and then board the boats and take them to the northern port of Haifa. In doing so they committed a massacre of unarmed civilians to add to the hundreds of massacres committed before but this time they have really gone way too far and alienated the international community with this horrendous crime. Time to demonstrate everywhere and write to all you know and all you do not know (media, politicians etc). Organize your own event (in front of Israeli missions abroad, in front of government buildings, in public squares etc) or join any of the planned emergency demonstrations. In Bethlehem we gather at the Nativity Square and march to the apartheid wall at 2 PM. I am convinced more than ever that the end of Israeli apartheid is close. No other system in the world today exists with this much social pathology and spiteful anger. It is lashing out without much logic. But while they try to fragment our society and finish us off, we still persist. The Haifa conference for the right of return and one democratic state was a resounding success despite the apartheid laws preventing us from visiting together in our own country (photos at). activities. But the powers-to-be has already lost and will lose some more as they always overreact giving more publicity to their intransigence. Millions of people are finding the truth. Please stay tuned to what is happening with the Gaza flotilla by going to , reading the articles below, and most importantly by writing to politicians, media, and other decision makers in your country demanding they pressure the apartheid regime in Tel Aviv to let those humanitarian ships through and to end its siege. That Israeli authorities (and unfortunately some collaborative Palestinians) are panicking about all these growing initiatives and activities. Action: Friday, June 4th, 12:30 PM, Convoy and rally near Herbata village, next to the Apartheid Road 443 to say enough to occupation, expulsion, expropriation and yes to liberation and independence. COME AND MEET MY NEIGHBOURS…. 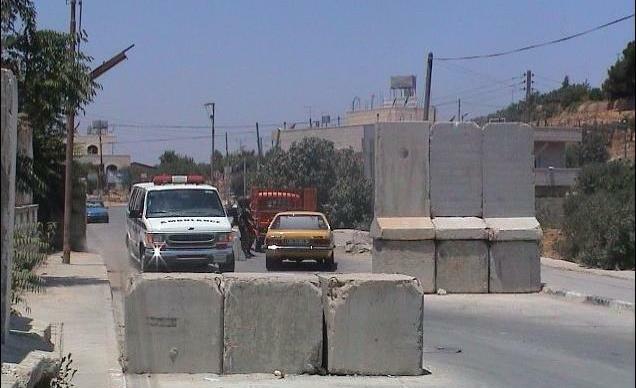 Oh wait, sorry you can’t right now….. Israeli police just blockaded their village…..
Israeli police began blocking an entrance to the East Jerusalem village of al-Issawiya today (30 May). The entrance, located next to the Hebrew University, is being blockaded with large slabs of concrete. The blockade comes nearly a week after Israeli forces, border police and intelligence officers raided al-Issawiya at 4am Monday morning (24 May). Following the raid, Israeli forces imposed a curfew on the village. Residents were questioned and detained on both 24 and 25 May as part of a “special tax evasion operation” being conducted by Israel’s Tax Authority, wrote the Israeli daily Yedioth Ahronoth. To conduct the raid and curfew, Israeli authorities exploited the indictment of Shirin Issawi, an attorney from al-Issawiya charged on Monday, along with four others, with transferring funds to members of Hamas and the Islamic Jihad currently in Israeli prisons. Issawi, 32, her brother Madhat, 36, also from al-Issawiya, along with Samer Abdo, 42, from Beit Hanina, Sofian Zabeda, 40, from Gaza, and Salim Abdel Rahman, 29, from Abu Ghosh, have all been accused of aiding the two Islamist movements in providing financial support to prisoners jailed for suspected “terrorist” acts or affiliation. In August 2007 the Association for Civil Rights in Israel (ACRI) submitted a petition to Israel’s Supreme Court demanding an end to mobile police checkpoints used for debt collection and tax payment by the Tax Authority and National Insurance Institute. Court justices criticized the method of debt collection, saying it “constituted a misuse of police authority that resulted in a disproportionate infringement of human rights,” according to ACRI. The Supreme Court suspended the use of debt collection roadblocks until a decision was reached. Shirin Issawi’s case was initially under a gag order, wrote the newspaper Haaretz, which claims to have a copy of Ms. Issawi’s deposition in which she complained of being tortured, imprisoned in harsh conditions and sexually harassed. The General Security Services (GSS) and Israel Prison Services are denying these allegations. Join us as we travel to Gaza. Witness what happens on board the boats. Watch our videos everyday. Stay tuned for WitnessGaza. There are as many as half a million Jewish settlers enjoying constant army protection in the West Bank. The vast majority of these are indoctrinated in an extreme right-wing ideology that views non-Jews living in Israel and the occupied territories as “lesser human beings”. Some of the religious mentors of these settlers openly teach that non-Jews living under Jewish rule — i.e. Palestinians — should be enslaved, expelled or annihilated. When challenged, these rabbis and mentors readily quote from the Old Testament and Talmud to corroborate their oft-genocidal viewpoints. The settlers are vehemently against the concept of peace with the Palestinians. They claim that retaining “the land of Israel” is far more important than making peace with the Arabs. Their most common slogan is “Arabs to the desert”. The more fanatical settlers, such as those of Hebron, have been heard to say “Arabs to the gas chambers”. Signs bearing such slogans are prominently featured in the small Jewish enclave in the occupied Palestinian town. This week, the Palestinian Authority (PA) began implementing a widespread campaign to boycott products manufactured in Jewish settlements and agricultural produce grown in as many as 100 Jewish colonies in the West Bank, many established on land seized by force from Palestinian landowners. The boycott, backed by all Palestinian factions, including Hamas, is viewed as a rare and effective Palestinian asset to show Israel that the occupation doesn’t pay off and that the Palestinian people will not allow themselves to finance Israeli oppression and repression. PA President Mahmoud Abbas and his prime minister, Salam Fayyad, displayed enthusiastic approval of the boycott, with Abbas taking part in a Ramallah ceremony launching the boycott campaign and Fayyad seen taking part in burning settlement products. Abbas has also been seen pasting a bumper sticker on his villa’s door in Ramallah, declaring, “This house is empty of settlement products.” Tens of thousands of similar stickers have been pasted on Palestinian doors throughout the West Bank. Israel, including the settlements, exports more than $5 billion worth of goods to the West Bank and Gaza Strip. In most cases, the Palestinians have no choice but to “import” these goods since they have no control over their border crossings, nor can they directly import commodities from abroad. In short, everything the Palestinians need must come either from Israel itself or through Israel, which means that Israel has an absolute monopoly over Palestinian imports. On the other hand, the Palestinians are not free to export to Israel as their freedom of movement — especially their ability to enter Israel — is severely restricted by the Israeli occupation army. Israel employs as many as 25,000 Palestinian workers, most of them suffering extremely humiliating working conditions. All in all, Palestinians export to Israel no more than $700 million worth of products and agricultural produces per year — a shocking imbalance in trade between the occupied and the occupier. Nonetheless, the settlers, who have arrogated the lion’s share of Palestinian water resources in the West Bank and who continue to expand their illegal colonies at their neighbours’ expense, have complained about the boycott which they called “economic terrorism”. Some settler leaders have demanded that the Israeli army seal entry points to Palestinian population centres and initiate a counter-boycott of Palestinian products. Others have asked the Israeli government to deduct hundreds of millions of dollars from Palestinian customs revenue collected by Israel on behalf of the PA government. Settlements in the Bethlehem region have warned that they will fire hundreds of Palestinian labourers working in local factories. Others have resorted to relabelling their products as originating in Israel proper, in order to trick PA inspection teams. However, Israeli countermeasures and threats have so far failed to stop or discourage the house-to-house Palestinian campaign against settlement products and produce. In fact, the PA has already gone one step further by enacting a law stipulating that anyone who deals in goods produced in Jewish settlements will be imprisoned for two to five years and fined up to $15,000. The law states, furthermore, that those who import settlement products into the Palestinian-run territories could face a jail sentence of up to six years and fines of up to $3,000 and confiscation of licences and vehicles. Israeli Prime Minister Binyamin Netanyahu has lambasted the Palestinian campaign against settlement products as “counterproductive to peace” and “a hostile act”. In statements carried by the Israeli media, Netanyahu claimed that the Palestinian campaign would hurt the Palestinians more than Israel. Netanyahu has long made statements about forging “economic peace” with the Palestinians, which according to him would prepare the ground for political peace. However, most Palestinians, including the Palestinian Authority and Hamas, have vehemently rejected Netanyahu’s proposals, dismissing them as “red herrings” aimed at gaining time in order to take over more Palestinian land and build more Jewish settlements. Israel on Saturday rejected as “flawed and hypocritical” a declaration by signatories of a global anti-nuclear arms treaty that urged it to sign the pact and make its atomic facilities subject to U.N. inspections. All 189 parties to the Non-Proliferation Treaty, including the United States, called on Friday in a declaration that singled out Israel for a conference in 2012 to discuss banning weapons of mass destruction in the Middle East. “As a non-signatory state of the NPT, Israel is not obligated by the decisions of this conference, which has no authority over Israel,” the Israeli government said in an emailed statement. “Given the distorted nature of this resolution, Israel will not be able to take part in its implementation,” it said. The 28-page declaration said U.N. Secretary-General Ban Ki-moon and key states would arrange a conference that would include all nations in the region, by implication including bitter enemies Israel and Iran. Israel is presumed to have a sizable nuclear arsenal but neither confirms nor denies it. It is the only Middle East state that has not signed the NPT and, like fellow non-members India and Pakistan, did not take part in the review conference. U.S. officials, irked at efforts to single out Israel, made clear the proposal might go nowhere, saying the Middle East could not be declared WMD-free until broad Arab-Israeli peace prevailed and Iran curbed its uranium enrichment programme. Iran was not mentioned in the NPT declaration. Israel and Western powers suspect Iran is seeking to develop nuclear weapons capability due to its past concealment of nuclear activity from the watchdog International Atomic Energy Agency and continued restrictions on IAEA access. Tehran says it is enriching uranium only to generate electricity and isotopes for agriculture and medical treatment. The Israeli statement said Prime Minister Benjamin Netanyahu would discuss the NPT declaration with President Barack Obama when the two leaders meet on Tuesday at the White House. Obama welcomed agreements on a range of non-proliferation issues at the NPT meeting but said he would oppose efforts to isolate Israel and any actions to jeopardize its security. Israel, whose jets bombed Iraq’s nuclear reactor in 1981 and mounted a similar sortie over Syria in 2007, has hinted that it could use force to deny Iran the means to build an atomic bomb. Libya in 2003 ended years of international isolation after it promised to give up nuclear, chemical and biological weapons and has followed through on those promises. “I don’t regard myself as a critic of Israel, I regard myself as a supporter of Israel”….. Ask yourselves one question, why did the Shtetl Jew of Czarist Russia dream of going to America, instead of Palestine? Answer, they wanted a better life. America offered ‘streets paved with gold’, while Palestine offered almost nothing. Many of those that made it to America wound up as wage slaves in the sweatshop… not quite what they dreamt of. But, I digress….. zionism was the last thing on the minds of these people. They were determined to make a good life in America for themselves and their children. They were, for the most part, Yiddish speakers. After long hours in the sweatshops many still found the time to enroll in courses to learn English. The early zionists tried to persuade them to learn the newly revised language, Hebrew. Most rejected this as there were no plans to leave the new land they now lived in. Zion would have to find other means to gain support for the land they wanted to conquer. They found the support they needed after the horrors of the holocaust were brought to light. The establishment of a ‘Jewish Homeland’ seemed the least the world could agree to at that point in time…. but NOT a homeland that would displace or kill millions of people in a new holocaust. But that is what happened, the establishment of the State of Israel meant the destruction of Palestine. Since 1948, this state has literally gotten away with murder. Since 1948 the West has been aware of this and has allowed it to continue, in most cases even financing these crimes. 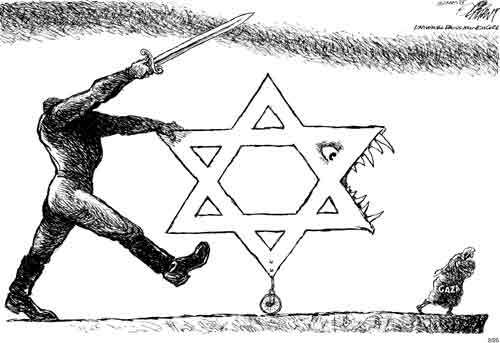 zionism literally has a hold on the entire world… WHY AND HOW? Where is the outcry of the Shtetl Jew that fled from a life under tyranny? Where is the outcry of the remaining holocaust survivors that lived the horrors being repeated today? Why does this man ‘have the whole world in his hands’? Is it not time to give the world back to its rightful owners, HUMANITY? Is it not time to sing a new song… like ‘LET MY PEOPLE GO’? An earlier post lumped HaAretz in with most of Israel’s media being used to spread the lies of the zionist government. Below is their attempt to ‘set the record straight’, so to speak…. The government has to decide right away to resume indirect talks with Hamas, to be more flexible about releasing prisoners and to lift the siege on Gaza. Ships adorned with banners and Palestinian flags in support of Gaza Strip residents, laden with consumer goods for a population that has been under siege for about four years, are threatening Israel. The Israeli government’s response and its preparations to block the “peace flotilla” give the impression that Israel, not Gaza, is under a brutal siege. Israel is finding it increasingly difficult to explain the rationale behind the blockade to the rest of the world. If it is intended to prevent Qassam rocket fire on Israel, then what was the reason for Operation Cast Lead? If Israel wants to use the blockade to put more pressure on the people of Gaza until they rise up against Hamas and topple it, or to spur Hamas to respond to the Israeli pressure, then the past four years have shown that this policy has failed. But the Israeli government knows exactly the price it must pay to free Shalit. It has already conducted indirect negotiations with Hamas and even announced that it was willing to release a large number of prisoners who are members of the Islamic group. The deal has been held up due to a number of prisoners who committed extremely serious crimes whom Israel refuses to release. Hamas police ahead of the arrival of an aid flotilla. Israel’s firm refusal to free those prisoners is becoming its most costly move so far. Relations with Turkey have deteriorated significantly due to Israel’s policy in Gaza. Several European countries that also view Hamas as a terror organization criticize the blockade policy. 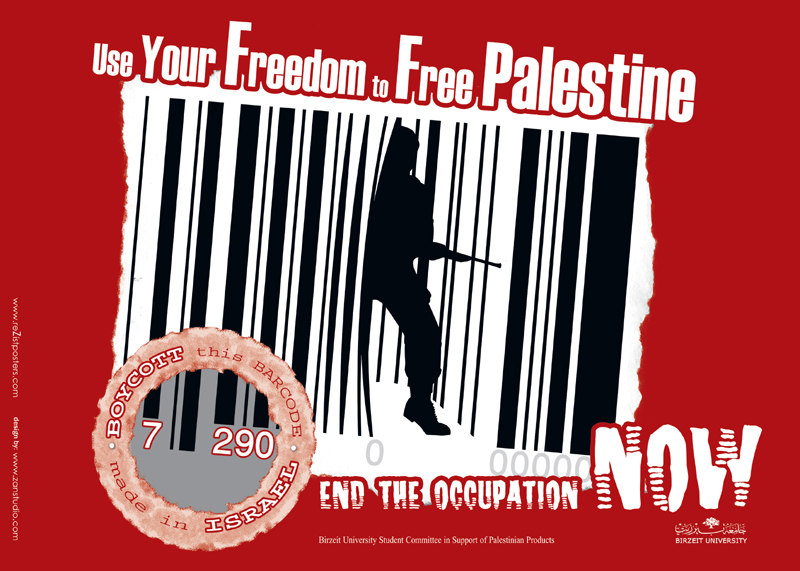 Israeli goods are being boycotted, while world public opinion no longer accepts the siege. The number of people, including diplomats and public figures, taking part in the Gaza-bound aid flotilla, clearly shows that. Israel argues that there is no hunger in Gaza and that vital products enter the Strip regularly. Israel even said it was prepared to deliver the boats’ contents to the Gaza Strip, but via Ashdod Port and using the Israel Defense Forces, not the boats directly. If so, this indicates that Israel is not opposed to the aid itself, but to the demonstration of support for Gaza’s people. However, this show of support could have been prevented from the outset had Israel lifted the pointless blockade and allowed Gazans to live normal lives. Even if Israel manages to prevent the flotilla from reaching Gaza, it will still have to contend with other demonstrations of support. The government would do well to decide right away to resume indirect talks with Hamas, to be more flexible about releasing prisoners and to lift the siege on Gaza. This price may well turn out to be lower than the cost of the damage to Israel’s status. As the Freedom Flotilla approaches ever closer to besieged Gaza, the Hasbara campaign continues full speed ahead. While Gaza continues to suffer the most methodical modern-day asphyxiation of modern history, where the most basic rights of child and adult alike…the right to food, to life, to work, to health, to learn, to play… are purposefully denied and where the lists of what shall be denied are crafted and tweaked on a weekly basis, then approved and applauded by friend and foe alike, we continue to hear the naysayers; even the media, misinforming, justifying, questioning why such a flotilla need attempt to sail to Gaza. Why the fuss and the worry. “We offered them alternative ports and crossings to enter…! *70% of the population survives on under a dollar a day (with an average family spending just 56 US cents on food a day). *41% of the population unemployed. *61% of the population is food insecure. 65% of children are. 65% of babies are anemic. *Fishing catches are down by 72% since fishing zones have now been further restricted to only 3 nautical miles at best-just below Sardine catch lines. *Allowable exports are at nearly 0% compared to 3000 tons of strawberries and cherry tomatoes and 55 million carnations that were exported to Europe and elsewhere previously. Imports are 70 trucks TOTAL since December. This is compared to 118 daily in the past. “Key principles of humanitarian action include that the aid be delivered with neutrality and impartiality, it should “do no harm” to the people and that it not be used to advance political objectives. These principles have been severely lacking in the international humanitarian operations in the Gaza Strip” reminds Alegra Pachecho, an attorney and worked for an international humanitarian organization in the Occupied Palestinian Territories for seven years. There is, of course, as GISHA points out, the obvious contradiction in terms of how the blockade can be so successful by Israel standards if Gaza, by Israel’s own admission, is “thriving”. We can hear statistics day and night. They are jaw-dropping, especially when we consider that they have been created purposefully; that their existence is actively encouraged: “The point of the siege is to put the Gaza’s on a diet, but not let them starve to them” said the Israeli government’s famous adviser, Dov Weisglass. But in the end, this blockade, this siege, this occupation, never was about food or unemployment at face value, as shocking as these statistics are. It is about creating a situation-of fear and insecurity and exhaustion and hopelessness- where we all agree to accept this siege willingly; this occupation; this slave-hood; where we are willing collaborators in our own imprisonment and we nod our heads approvingly, helplessly, reflexively, and laud the noble efforts of the humane occupier, the pioneer of empty lands, an once an anti-imperialist democracy and the Undertaker of freedom. And by we, I do not just refer merely to Palestinians. First read the following articles regarding the situation…. Maariv, Haaretz, Yedot Ahronot, Jerusalem Post, Israeli TVs and tens of other Israeli media outlets seem to be recruited by the government of Israel now. As the aid convoys approach Gaza by the Mediterranean, the media outlets step up its propaganda and PR campaign. 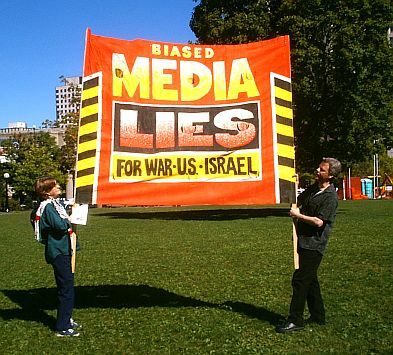 The propaganda portrayed in these media outlets will never succeed to changing the damaged image of Israel. The whole world knows the concrete facts about the state of Israel. The state of Israel has been built through blood, violence, ethnic cleansing, political betrayal and guerrilla wars against the unarmed Palestinians in 1948 and prior to that. More than 7 wars have been launched by Israel against their Arab neighbors in Syria, Lebanon, Palestine, Jordan and Egypt. Even, the attacks of Israel reached Tunisia and Iraq thousands of miles from that state! Observers could easily notice an entire integration between Israeli media and the official stance of the government. Israel’s official stance is trying to tell the international mainstream that there is no siege in Gaza. This totally contradicts the facts being said repeatedly not by Palestinians but by Amnesty, Human Rights Watch, OXFAM, USAID, CHF, UNRWA and tens of other organizations. These organizations clearly stated in their reports that Gaza is in Plight, crisis and inhuman living conditions. 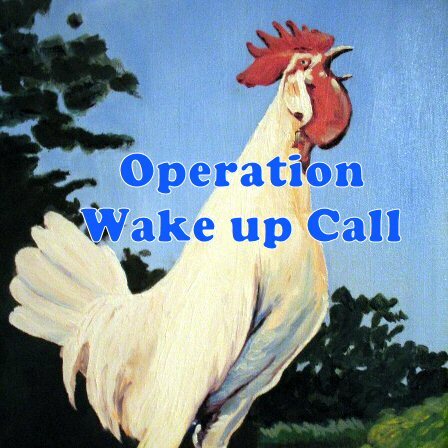 An example can be found in a report issued a few months ago by OXFAM. Haaretz and Yediot Ahronot circulated a very piece of propaganda regarding the Israeli soldier detained in Gaza, Gilad Shalit. Both of them, cried on Gilad Shalit as if he was an innocent civilian captured from inside Israel. They didn’t show the way he was detained or why. Shalit was in the front, inside his tank firing at the borders of Gaza in Rafah. Shalit might kill few Palestinians in his short time with the army. Sadly, the newspapers tried to bring his issue ahead to the Freedom Flotilla which is carrying thousands of tonnes of aid to Gaza. Both of the papers published articles stated that “organizers decline carrying a package to Gilad shalit” However, this turned untrue. I spoke with a number of organizers like ECESG and people from the Free Gaza Movement. They both said, “No one contacted us”. We are ready to take this package to Shalit. But in return, we need a commitment from Israel to allow Palestinian families to visit their sons, brothers, sisters, children, women in the dozens of Israeli jails. Both of the papers are trying to draw the attention on the suffering of Gilad Shalit and his family. They aim at keeping the spotlight on him so less attention can be given to the Freedom Flotila. More importantly, by saying organizers decline to send this package; those organizers can be seen as inhuman, hypocrites and liars. Normal readers will think how come those organizers are going for a human aim to Gaza whilst they refuse to have this human package to captive fighting solider, Gilad! The media in Israel tries hard to neglect the issue of Palestinian prisoners. There are 8.000 Palestinians in Israeli jails. They live under hard living conditions while their families are denied visits since 4 years especially those from Gaza. The other part of PR-Propaganda campaign has been adopted by the Israeli government and backed by Israeli media outlets. The government mandated the foreign affairs ministry to explain with photos, statistics and numbers that there is no siege in Gaza. Even the Prime Minister of Israel himself, Binyamin Netanyahu, announced a list of luxurious restaurants that journalists should visit in Gaza. He tried to say that these places are running there is no siege. But the fact is that these restaurants are running because of the tunnels. Defense Minister Ehud Barak insisted that there is no humanitarian crisis in the Gaza Strip. The International community promised to rebuild Gaza and dedicated hundreds of millions of dollars for this aim. But Israel has denied and still the construction materials to get into Gaza. There is no doubt that aid convoy coming by sea will help the people of Gaza. If Israel cares about its image, then it has to adopt peace as a choice. It has to end occupation and lift siege. 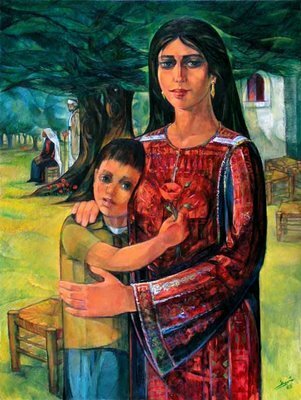 It has to give life to the children of Gaza. Israel should meet its so-called morals as an independent state. The actions of Israel are slow holocaust like and partly are genocidal towards the people of Gaza. Israel will only get good PR when it gives the children of Gaza new life. Baby Feras, 6 months, who died a few months ago, will always chase those were behind the reason of his death. 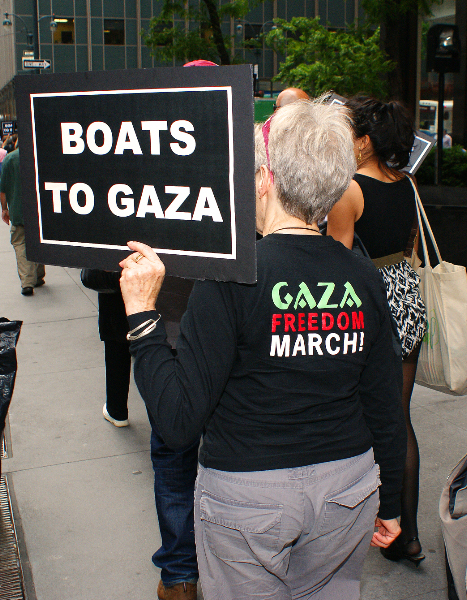 Days before a probable showdown at sea between Palestine solidarity activists traveling with a nine-ship fleet and the Israeli Navy, demonstrations took place across the United States and the world today to demand that Israel allow the activists safe passage to Gaza to deliver 10,000 tons of humanitarian aid. 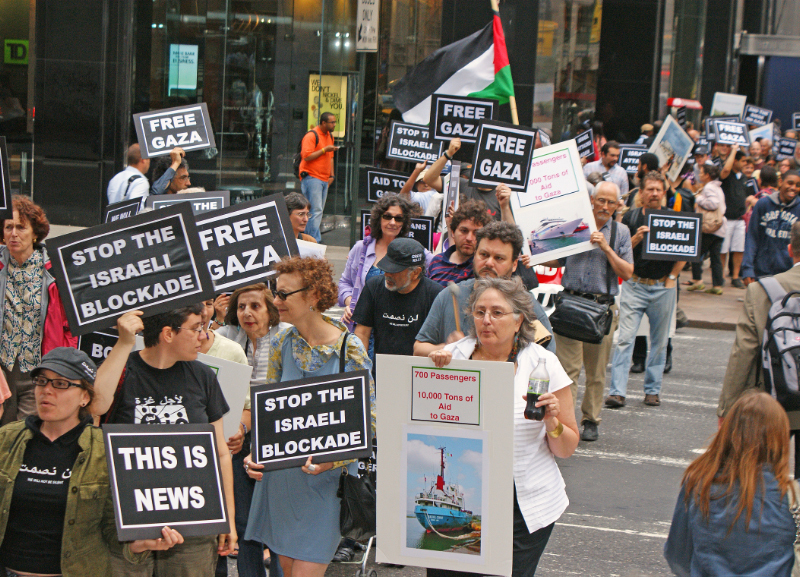 In New York, more than 100 people gathered outside the building of the New York Daily News to call attention to the lack of news coverage of the flotilla, walked past the Israeli Consulate and marched to Times Square chanting “Break the blockade, Gaza needs aid.” They passed out hundreds of fliers to pedestrians explaining how the “Freedom Flotilla” was attempting to break the blockade of Gaza and what the potential Israeli response could be. 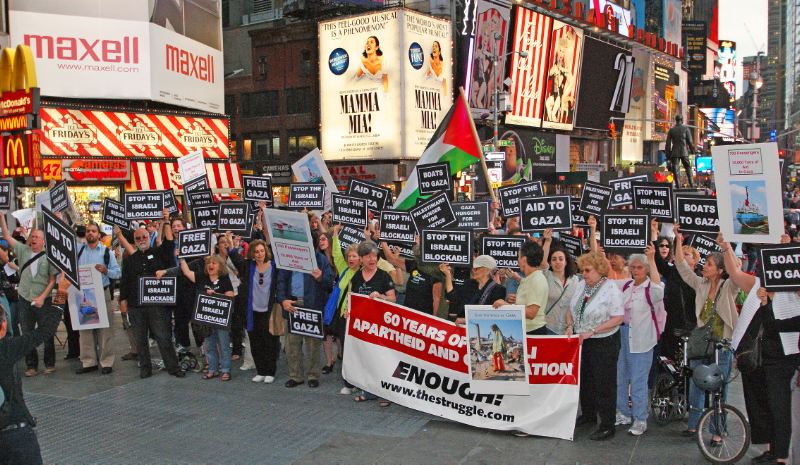 In Times Square, demonstrators gathered in the center and chanted “Free, free Palestine” while tourists looked on and snapped pictures. 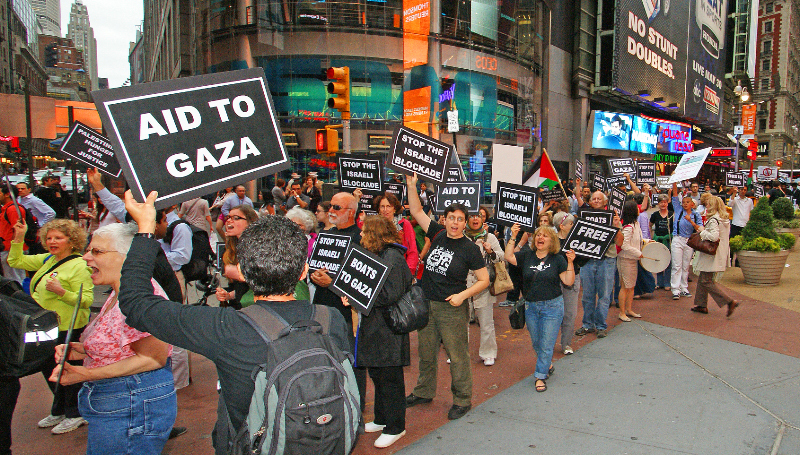 The action was organized by a coalition of local groups, including Adalah-NY, Al-Awda NY, the Activist Response Team, Gaza Freedom March and Jews Say No. The “Freedom Flotilla” is made up of nine ships that are currently in the Mediterranean Sea. The ships are stocked with badly needed aid, like construction materials, medical equipment and school supplies, for Gazans; such aid has been blocked by a crippling Israeli naval, air and land blockade. 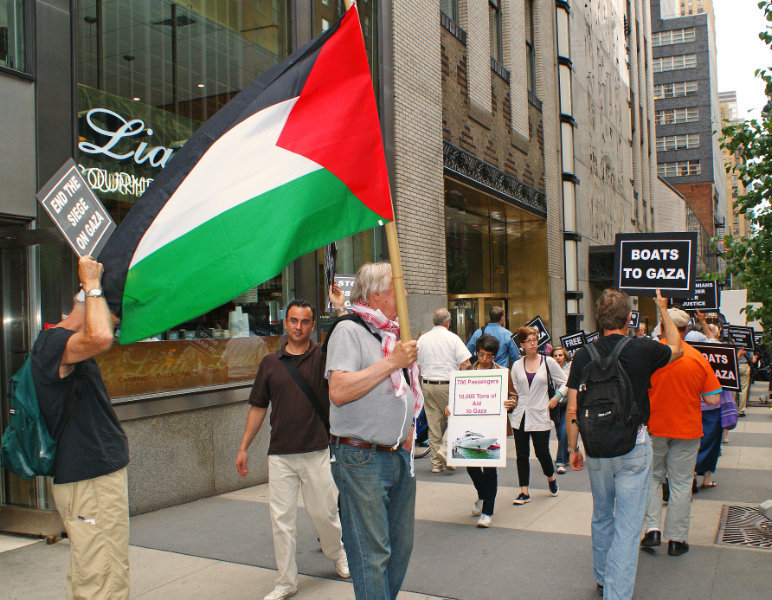 Palestine solidarity activists from more than two dozen countries, including the United States, are also part of the flotilla. The Israeli Navy has vowed to stop the ships from reaching Gaza, and has set up a makeshift detention camp at the southern Ashdod port in Israel for processing, detaining and deporting the activists that are part of the mission. “Through their system of apartheid and occupation, they’re denying the Palestinians the right to live,” said Randa Wahbe, a Palestinian-American active with Students for Justice in Palestine at Columbia University and Adalah-NY: The New York Campaign for the Boycott of Israel. Israel and Egypt’s blockade has badly damaged Gaza’s economy. More than 80 percent of the population is dependent on humanitarian aid, 35 percent of Gazans are unemployed, and 90 percent of Gaza’s industry is closed or operating at less than 10 percent capacity. Many homes and buildings damaged and destroyed as a result of the 2008-09 Israeli assault on Gaza remain that way because Israel has not allowed in enough construction materials. 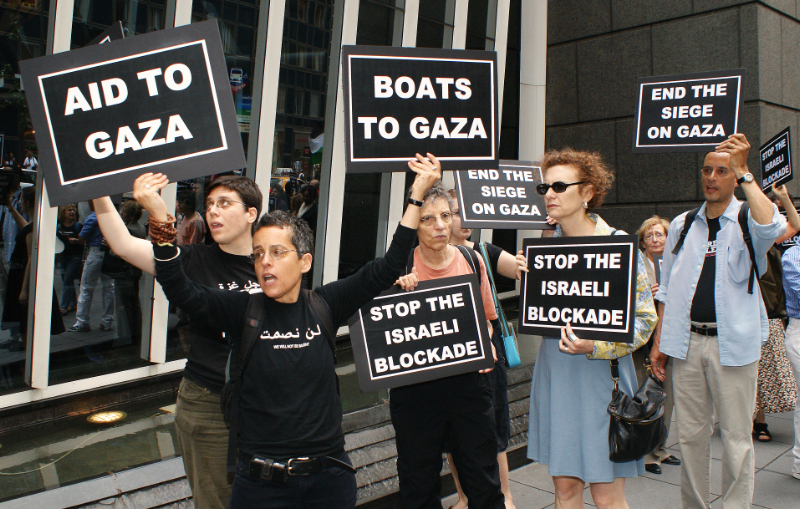 A Turkish humanitarian group and the Free Gaza Movement, which has put together eight other attempts to break the naval blockade of Gaza, organized the flotilla. 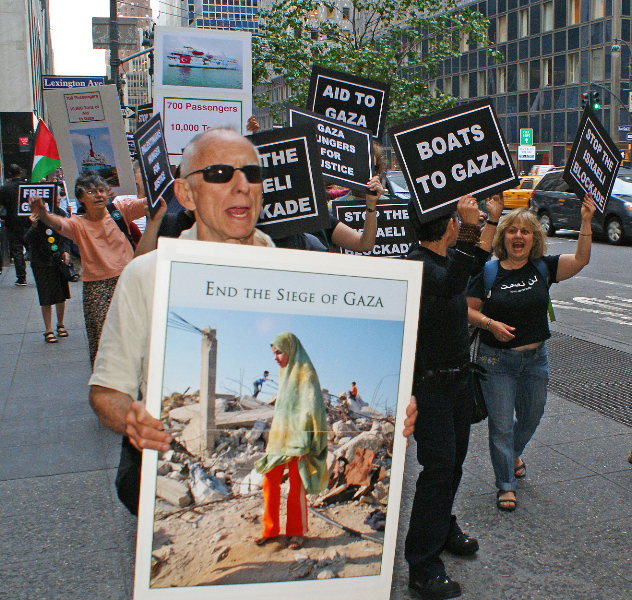 While some past attempts by the Free Gaza Movement to deliver aid were successful, recent missions have been met with Israeli violence, including the ramming of a Free Gaza boat and the detention and deportation of activists, including former U.S. Congresswoman Cynthia McKinney. “We should be demanding that Obama stop his brutal silence and tell the Israelis to let the boats in. 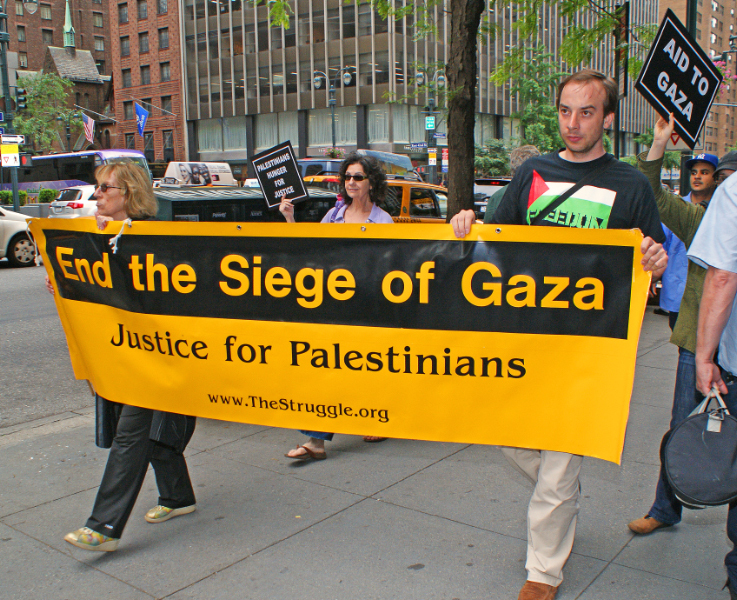 Gaza is not part of Israel,” said Stanley Heller of the Connecticut-based Middle East Crisis Committee. “What will happen? I don’t know, but if there’s enough people who scream and yell, it will become an embarrassment” for Israel. Any Israeli move to block the ships from entering Gaza could backfire: Turkey’s Prime Minister has called on Israel to allow the boats through, and an Israeli Foreign Ministry spokesman told the Wall Street Journal that, “we can’t win on this one in terms of PR.” Israeli relations with Turkey have deteriorated since the Israeli attack on Gaza. In recent days, the Israeli government has embarked on a public relations campaign aimed at spinning what is likely to be negative coverage of the Israeli Navy forcibly stopping a humanitarian mission with lawmakers and activists on board. Israel claims that there is no humanitarian crisis in Gaza, that enough aid is allowed in and it must maintain control over the seas because the country is in a state of armed conflict with Hamas, the Islamist movement that governs Gaza and is holding an Israeli soldier captive. International organizations and the United Nations give a bleak picture of life in Gaza, and human rights groups say that Israel is violating international law by collectively punishing civilians in Gaza. More pictures from May 27 action. COULD TURN AGGRESSIVE???? What have they been until now? 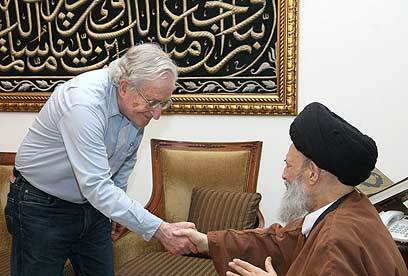 That’s what I love about Chomsky…. he says it as he sees it…. but he might need new glasses. Jewish-American linguist Noam Chomsky met with the spiritual leader of the Shiite Muslims in Lebanon, Sheikh Muhammad Hussein Fadlallah, on Thursday and told him that if Israel felt backed against a wall it could turn aggressive. 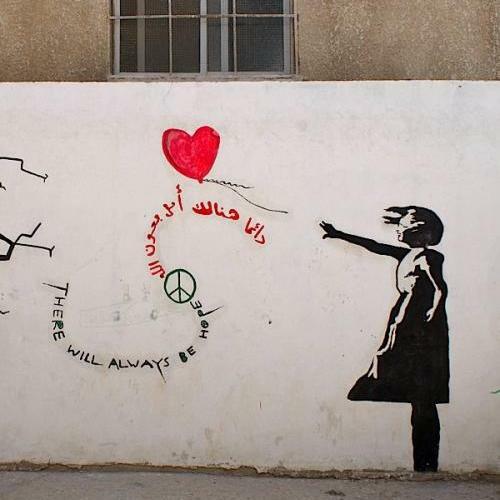 It is not possible to foresee what Israel will do, because if it feels besieged it could turn aggressive, Chomsky said. Israelis’ actions are based on a persecution complex, meaning that aggression would not be an option again except out of a “mentality of madness” which rules many in Israel. Fadlallah said that the balance of forces do not enable Israel to attack Lebanon again. The existence of the insane mentality in the “Zionist entity” demands great care, he said, but this insanity will not push “the enemy” to suicide. Fadlallah, the spiritual leader of Hezbollah, said that the “opposition” has experience, capabilities, readiness on the ground and strategic plans that can overturn the “entity” and prevent the enemy from taking on new adventures against Lebanon. According to Fadlallah, the main problem is the US policy and its reliance on the Zionist entity. This policy, he said, does not honor humanity or human beings. He added that his movement is against the Zionists but not against Jews or Judaism. Some ten days ago Israel prevented Chomsky from entering the West Bank, where he had been invited to lecture at Bir Zeit University in Ramallah. The prevention drew extensive criticism from academics and leftwing organizations. Prime Minister Benjamin Netanyahu was compelled to comment, saying he had learned of the fact only through the press. Security sources accused the Interior Ministry, saying it had acted alone when it prevented a Jewish professor to pass the Allenby border crossing. The Interior Ministry blamed the Coordinator of Government Activities in the Territories. ….. invited you to join the Facebook group “1,000,000+ people who disapprove of building a mosque at Ground Zero!”. ….. says, “OMG this is UNREAL!!! Bloomberg has lost his greedy mind!”. Makes’ya kinda proud to be an American! 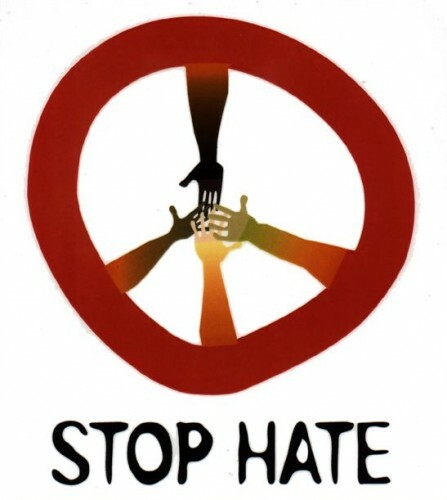 Write to Facebook and join the BILLIONS opposed to this racism! !